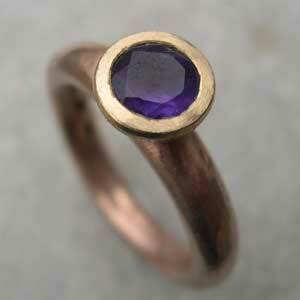 This Engagement Ring is handmade, large bold and chunky, set with a beautiful deep purple Amethyst. The ring is slightly irregular, and has a lightly hammered surface texture. We hand brush the gold to give a matt finish. Free ring sizer - If you are interested in buying one of our rings, contact us giving your name and address and we will post you a ring sizer.